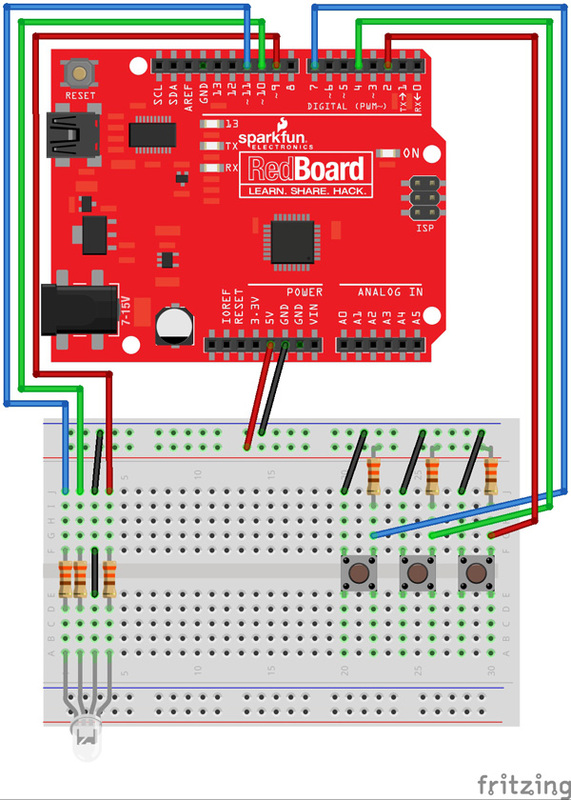 In this exercise, students will learn about RGB LEDs and be able to execute simple if statements to create a button controlled color mixer. When the red button is pressed, the LED will shine red. The same will happen when the green or blue button is pressed. When two buttons are pressed at the same time, a mix of the two colors will shine. (e.x. pressing the red and blue button at the same time will results in a purple LED.) When all three are pressed, the LED shines a mix of all three colors. RGB LED: This is essentially three LEDs in one. A red, green, and blue LED are housed within a normal LED housing. Each internal LED shares to the same ground wire, resulting in four total legs. To turn one color one, connect the common ground to ground and the desired color to power. Powering multiple colors will result in a blending color, as the illumination from the multiple colors blend together. Theese LEDs will act as OUTPUTS in our code. Push buttons: Push buttons are simple circuit swtiches that close a circuit when closed, allowing electricity to flow through. This circuit uses three push buttons: one red, green and blue to turn on the corresponding LEDs. These push buttons will act as INPUTS into our code. Now the code. The code is very simple so that students can easily get the functionality working right away. Then, they can explore coding concepts that will change the functionality of the LED. Here are a couple concept questions that explore the use of if, while, and do while statements. This is a great opportunity to have students predict the changes, then implement them to see what happens to the LED, so they can actively think about what the code means rather that just copy paste it. //ButtonState will a reading of the whether the button is pressed or unpressed, this will be important in having the change of state of the button execute a change of state in the LED. //This variable will change, so we just initialze it to zero as a starting point. // set up the ButtonState readers for each LED. // digitalRead will read the state of each pin everytime this part of the code loops, allowing us to determine if the button is being pressed or not. // Question for students: why does this chunk of code need to be in the void loop part? // Why are we turning the LED HIGH whne the ButtonSate is low? // This is because of the pull-up resistors used in the circuit. // which is very bad and is also known as a short. // Why use the Serial.println? // we know something in the circuit must be wrong. Q: What do you think will happen when you comment out the else statement? What happened when you did? A: Without the else, there is no condition for when a certain button is not being pressed after it has initially been pressed. The corresponding LED will just remain on, and any additional button presses from the other two colors will turn on their corresponding colors as well. This will still result in color mixing, but you won’t be able take out a color once it’s button has been pressed. Q: What do you think will happen when you change the if statements to while loops? What happened when you did? 1. How can you do the same project using analogWrite instead? 2. Using analogWrite, make the duration of the button correspond to the brightness of that LED. Or make it correspond to the saturation of that color’s LED.